Pomina 2 Steel Corporation, branch of Pomina Steel Joint Stock Company and one of the largest Vietnamese steel manufacturers, has awarded a new cold rolling mill complex to Tenova, to be realised in Ba Ria Vung Tau Province (Vietnam) for high quality products based on the highest standards in the market. The cold complex layout has been designed to optimise coil storage, material flow and facility productivity to meet the needs of a firm in possible future expansion. In addition, the project has been conceived to offer a sustainable solution by minimising waste emissions in the acid regeneration plant and in line with the stringent regulations for the cold rolling mill complex as a whole. The project includes a push pull pickling line with acid regeneration plant, a six high cold reversing mill, a roll grinder, a hot dip galvanizing line and a color coating line. The envisaged total production is 375 000 tpy of high quality pre-painted galvanized and cold rolled coils, with the provision of future expansion to almost double the capacity. The incoming hot rolled strip has a width up to 1250 mm with thickness from 1.6 - 4 mm. The output strip will have a thickness ranging from 0.2 - 3 mm. The cold rolling mill and the hot dip galvanizing line have been designed to offer the client the most up to date technological solutions in the market. The cold rolling mill has a maximum rolling speed of 1400 m/min. with automatic gauge, flatness control systems and multi zone cooling. The hot dip galvanizing line will be equipped with Tenova own air knife system, offering a complete in-house technological package. The plant will be full operative within the end of 2018 and allows Pomina 2 to enter in the production of flat products for the domestic and external market. 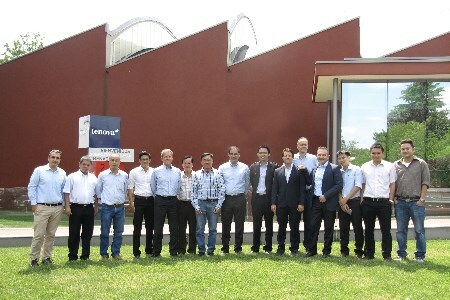 Tenova was awarded this contract following the past projects realised in Pomina Group for steel making including two Consteel® EAFs, Tenova proprietary technology, and thanks to the numerous successful references earned in Vietnam over the past years. The awarded and executed projects confirmed Tenova valuable reputation in Vietnam and increased its market share in the region for high quality products.